Gent - Wevelgem Flanders in the Fields tonight. Tour of Catalunya: Formilo won the final stage. Adam Yates gave the GC a huge crack, but the distance from the last hill to the finish was too great. MAL holding on to win the GC. Dwars door Vlaanderen this Thusday - no Matthews even though this suits him down to the ground. He is riding the Ronde on Sunday though. Lucas Hamilton won the Coppi e Bartali; MS had a 1-2-3 in the GC (Howson was 2nd, Schulz was 3rd). Trentin is riding well but having little luck achieving results that he deserves. Got into the early elite break which then thinned down to four riders but was caught with 18kms to go. 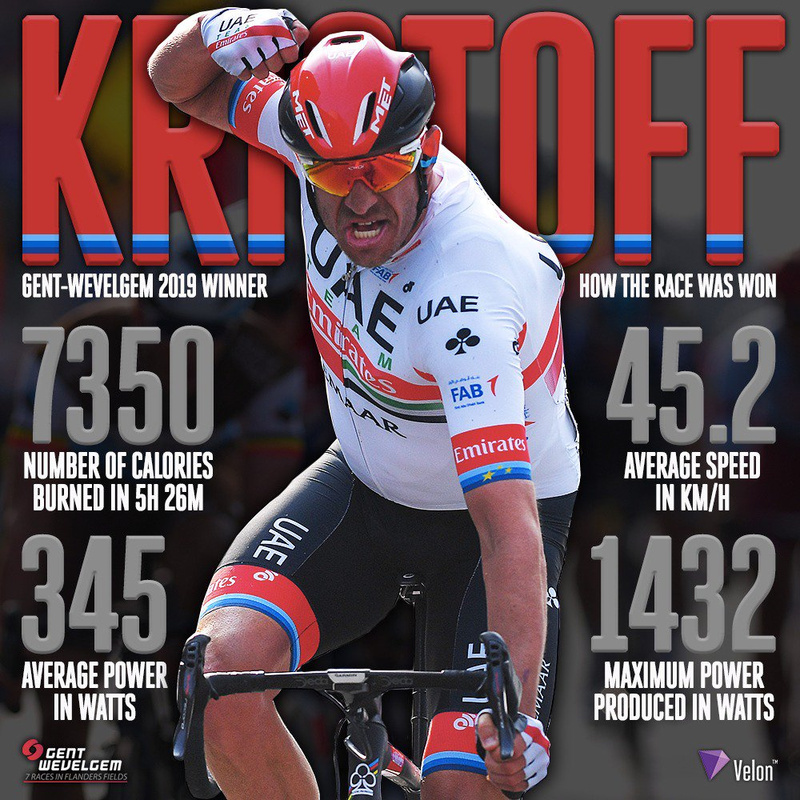 It was an awesome ride by Kristoff who spent unsuccessfully chased the break for a while but could then produce a strong sprint. Good ride by Bauer who nearly stole it in the last 4kms. Sagan looking good for Flanders. Reckon A.Yates has been the strongest rider at TA and Catalunya but hasnt received full reward for his efforts. Hamilton is tracking beautifully and want to see his performance at Basque Country. MVDP wins Dwars door Vlaanderen from Tugis. Womens race was marred by crashes and the mens race had to be halted to allow the women to finish. Bettiol with a huge result for EF, winning the RVV. All the favourites sat there watching each other until too late. Basque Country starts tonight, and Paris Roubaix next Sunday! RVV was a strange race. Good weather, a relaxed tempo and yet the stronger riders were flat. Van Der poel would have won if he didnt crash with 20 kms to go. Disappointing classics campaign so far for MS. They need to beef up their squad. Not sure if this video will work - but this is 3rd place in women’s RVV dane Cecilie Uttrup Ludwig reliving the final stages of the race. Strange happenings in stage 2 of Basque Country. A.Yates punctures on the last gravel section of stage 2. Instead of swapping bikes with Nieve, he swaps wheels with Howson and ends up losing one minute and 12 seconds. Comedy capers. Amazingly no major crash in the Scheldepris (Jabosen wins); how bad is Kittel these days? But a big one in Basque Country, Adam Hansen and Castoveijo hospitalized, Thomas, Kwiatkowski, and Alaphilippe all knocked out of GC contention. In the last 18 months, Kittel has struggled to keep up with his lead out in the last 1 km. 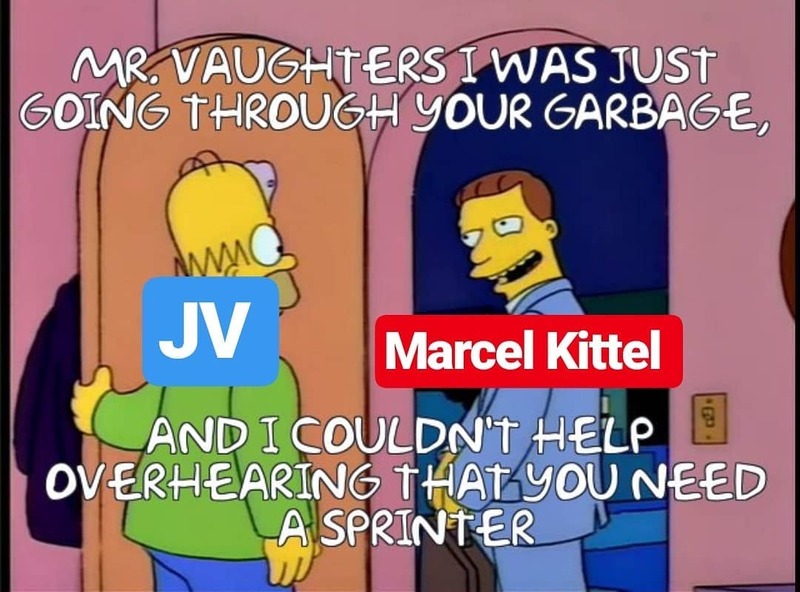 So often the lead out is looking for Kittel. Seen enough of A.Yates to believe he should come top 5 in the TDF. And if MS ride a smart race then he can podium LBL. Gotta say the team for PR is weak. It comprises three neo pros, hepburn whose role is to ride at the peleton to cover punctures, mezgec who is out of form. Only Trentin and Bauer have form. Dubro and co injuries pretty much killed the cobbled classics team. Even with Durbo and Edmo the classics team lacks depth - I’m surprised they haven’t used Smith for some of these races - Anyway the team needs to beef up this area. And Schachman is gifted stage four of Basque country after GC teams failed to ride hard he Cat 1 climb with 40kms to go when he was struggling near the back of the lead group - I suspect he’ll be found out in the next two stages - Teamwork of MS this season has been excellent - Finally, Hamilton continues to impress. I’d start L.Hamilton in the TDF instead of Howson - he’ll provide more support than Howson and perform as well in the TTT. Adam Yates wins the final stage of Basque country. If he hadn’t had that flat on stage 2! Bora somehow **** up the final stage to hand the GC to Izagirre. A.Yates needs to keep it together to the TDF and a top 5 is beckoning - Actually been happy with every rider’s performance in Basque Country - Team for Giro will be interesting - Believe that S.Yates, Nieve, Haig, Chaves and Bewley are locks - Last three spots will come from Grmay, Smith, Howson, Hamilton, Meyer etc - Personally I’d go with Smith,Mezgec and Trentin. Gilbert just dominant at Paris Roubiax. You could see he was going to win it with 50km remaining. End of an awful classics season for MS. Topped off when a spectator knocked Bauer off his bike.